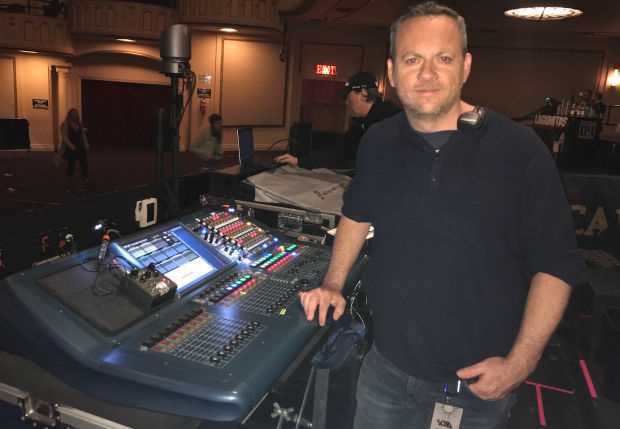 Touring the world with Grammy-nominated reggae band SOJA, FOH engineer Michael Versteegt has discovered how to make the most of the mix and connect with crews overseas. Michael Versteegt mixes SOJA on the band’s Midas Pro2 console, using a Strymon El Capistan dTape Echo guitar pedal (at left) for dub effects. Port Chester, NY—Together since high school, SOJA has spent the last two decades touring the world, bringing its roots reggae music to the masses. Dedication to the craft has helped the band garner 7 million online followers, rack up more than 300 million YouTube views and land two Grammy nominations in the process. Currently on the road supporting its new Poetry In Motion album (ATO Records), SOJA is just as likely to be in the air, heading to South America and Europe, which it tours just as often as the United States. As a result, the group averages 120 shows a year, and that’s probably a low figure, says veteran FOH engineer Michael Versteegt. An added bonus, however, is that he gets an opportunity to perform with his mix, thanks to the band’s proclivity for dub music. “Reggae involves a lot of dubbing,” Versteegt explained. “You can throw in effects, and it gives you a lot of play to create your own soundscape, which is always a lot of fun. They give me a lot of freedom with the dubbing, so it’s something I do just about every night. I have certain parts that I do, but it’s not always the same; I might improvise if I feel that something needs to be changed. The eight-piece band fills up 40 inputs on its Midas Pro2 digital console when touring the U.S., but picks up local Avid Venue Profiles when overseas. Versteegt eschews outboard gear other than the Strymon pedal, but is now venturing into the world of plug-ins: “We have a laptop that we use for multitracking the shows, and now I’m starting to get into plug-in hosts like Waves MultiRack and LiveProfessor by Audiostrom to bring in effects that you can’t typically use on the Midas console.” The band carries its own control gear, cabling and miking, the latter a varied selection of Shures, Sennheisers, Miktek, Heil and AMT microphones and Radial DIs. This summer, the band’s heavy schedule will find it playing festivals as far ranging as Bottlerock in California’s Napa Valley; Summerjam in Cologne, Germany; and Reggae Sun Ska Festival in Vertheuil, France. That far-flung fanbase is no accident as the band makes a point of speaking to audiences in their native tongues, recording songs with guest vocalists like Collie Buddz and Damian Marley, and welcoming regional stars on-stage—Marcelo Falcão of O Rappa has sat in with the band in Brazil and likewise Balik from Danakil in France.